Today our 2018 Bonanza continues with a Hawaiian species of honeycreeper: the Palila! Many species of Hawaiian honeycreeper are endangered or face threats, and the Palila is no different, unfortunately. The Palila is considered to be critically endangered, due in part to loss of habitat. Palilas are highly dependent on the Mamane tree. This association includes using the tree as a food source and nesting habitat. Tomorrow's new bird is Europe's largest species of pigeon. Can you guess which species it is? Earlier this month, the Iiwi ('I'iwi), a beautiful Hawaiian finch, was introduced as the American Birding Association's Bird of the Year for 2018. We think it's an interesting and excellent choice! In 2016 Hawaii was added the ABA Birding area by popular vote, and the process of adding species to the official checklist was completed last year. So it makes sense to feature a Hawaiian species in 2018. The Iiwi is a type of finch, part of a group of Hawaiian honeycreepers. More than 50 species of honeycreeper used to call Hawaii home. Today less than half of those species still exist. They face threats including predation by introduced species and competition from invasive birds, as well as habitat loss and disease. Of the native birds of Hawaii, the Iiwi is the most common. The beautiful Iiwi can be recognized by its bold scarlet and black plumage, and by its long curved bill. In many ways the Iiwi behaves like a hummingbird, hovering in flight and drinking flower nectar. Be sure to visit the ABA's Bird of the Year page to learn more about the Iiwi! Zebra Finches live in Australia and can be found across most of the continent, avoiding only some cold parts in the south and tropical parts of the north. The birds also naturally occurs in Indonesia and East Timor and were introduced to Portugal, Brazil, Puerto Rico and the United States where the species has established new populations. Our featured t-shirt design this week is Zebra Finch Statistics featuring a male and female bird next to each other and the main differences and characteristics pointed out, such as the gold cheek patch of the male and oranger beak of the female. The scientific name "Taeniopygia guttata" is shown below. This graphic tee is available in many different styles and colors and can be customized to make a one-of-a-kind gift for zebra finch lovers and bird pet owners. We're adding new birds each day until we reach our 500th Birdorable species! 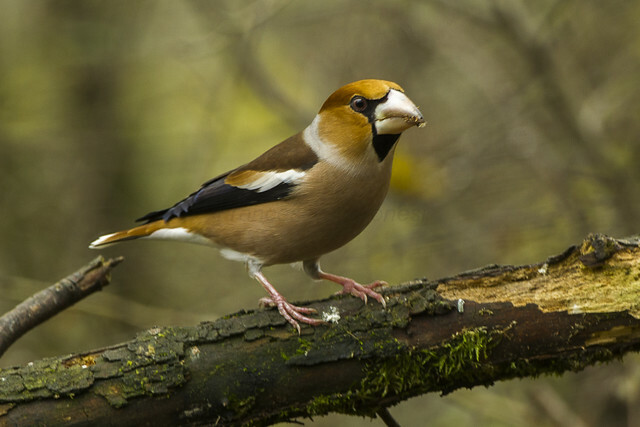 Today's Bonanza bird is the Hawfinch. Look at that massive bill! Hawfinches are bulky birds, with large heads and stout bodies. Their large finch beaks have a metallic look to them. Hawfinches feed on hard seeds, including cherry pits and olive pits. Hawfinches are social, often feeding in groups -- especially in the winter. They tend to be shy around people, but will visit feeding stations that offer seeds. Tomorrow we'll add a somewhat elusive species of heron found in the Americas. It's a small one!